Commentary: "Just different to make you mad" has been a recurring theme here, especially since 2005 when Hasbro put a lot of toys in circulation in a short period of time. And again in 2006. And again in 2007. "The same figure with dirt on its shoes" was a common thing, and this Rey does it with salt. 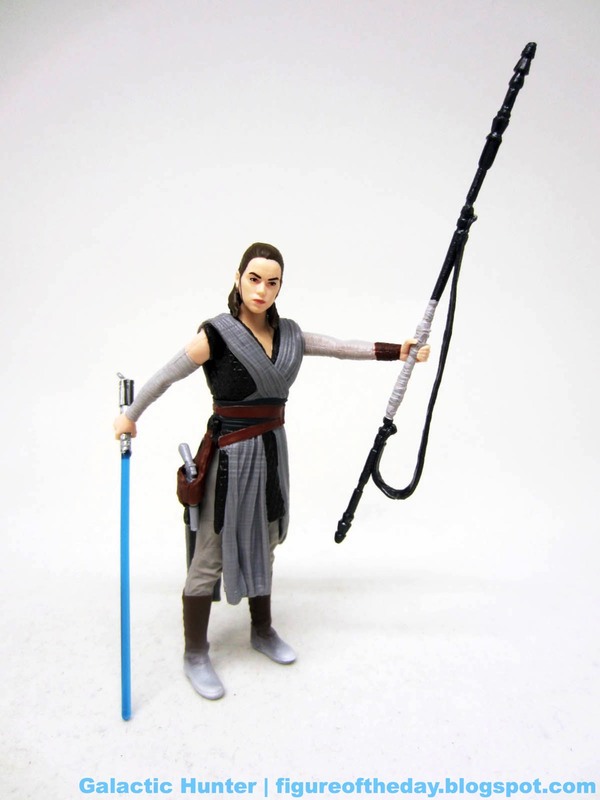 She's pretty much the same as Rey (Jedi Training) [FOTD #2,445], the made-in-China figure with less hip movement and better accessory detailing. Love how her face is painted, it's a lot sharper and has a lot more personality than the single-carded Rey from last year. Deco is sharp but it's pretty much the same as the carded figure, save for batch changes and one added point of decoration - salty boots. Inspired by Bolivia, Rey has white on her shoes. That's why this one is special - we've seen the same thing with R2-D2, Chewbacca, C-3PO, Darth Vader, and we've seen grass stains on Stormtroopers too. I realize many may furrow their brow, but I applaud Hasbro for having actually made it different. For the last two films, we got a Rey and a Jyn that looked pretty much the same. This is not fun nor is it terribly interesting. While I'd rather have a new figure, that wasn't an option. A change beats no change, variations may not always be exciting but I'll take any sort of change rather than a third nearly identical Rey. She's the least interesting part of the boxed set, but at least she is a little bit different. If you see this set in a store, go ahead and snag one. You're worth it. For $25ish, the set is too.